A black hole is photographed for the first time, thanks in part to Katie Bouman. Amazing. And this amazement applies to the first image of a black hole in space as well as Ms. Bouman’s ground–well, space–breaking algorithm. Life is about pushing boundaries, which is a particular topic of interest with the release of ‘First Man’ starring Ryan Gosling and Claire Foy and the recent theatrical release of the CNN documentary ‘Apollo 11’ chronicling America’s groundbreaking moon landing. While in awe of the image shown above, American theoretical physicist and Nobel laureate Kip Thorne and the science fiction epic ‘Interstellar’ by Christopher Nolan immediately came to mind. ‘Interstellar,’ while fiction, is painstakingly rooted in real science. Creating a realistic depiction of a black hole was pivotal to the story for the filmmakers, writers, and audience. Was the ‘Interstellar’ crew right with their image of a black hole back in 2014? Kip Thorne, Christopher Nolan, and the entire ‘Interstellar’ team were pretty damn close with their depiction of a black hole in 2014 to the first image of a black hole in 2019! Who else is going to watch ‘Interstellar’ again? This scientific revelation as compared to a cinematic epic validates and builds upon the lore of Mr. Nolan’s brilliance as a filmmaker and storyteller of spaces beyond our earthly realities. 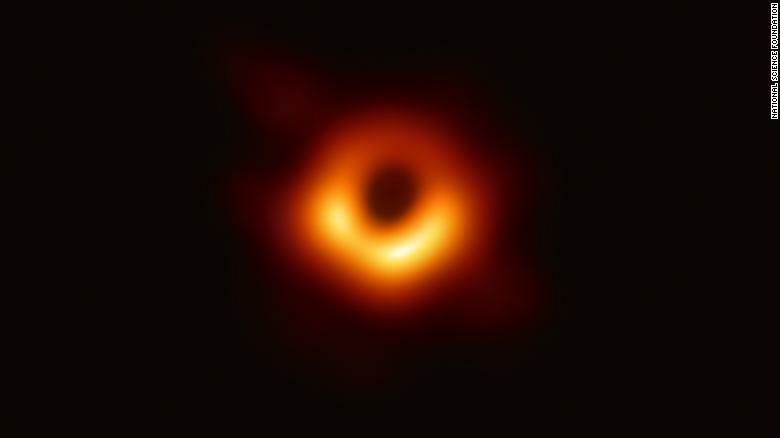 More importantly, the first image of a black hole is a game-changer in ways we are only just beginning to comprehend. Yesterday was another giant leap for mankind. With ‘First Man’ in theaters, the highly-anticipated cinematic adventure that chronicles the Appollo 11 mission to the moon, has been receiving rave reviews. Perhaps this shouldn’t come as much of a surprise considering the same director, lead actor and composer from the smash hit ‘La La Land’–Damien Chazelle, Ryan Gosling and Justin Hurwitz–have returned to showcase the epic story–with new sub-stories–from this groundbreaking moment (well, decade) that changed human history forever. Speaking of ‘La La Land’ and composer Justin Hurwitz, the soundtrack of a film is a powerful force and can even define the movie itself. We all know music’s starring role in ‘La La Land.’ With any other music, movies wouldn’t be the same. The same story, feeling, and impact of a spectacular soundtrack would not be projected onto the silver screen and then into our imaginations. While I will be seeing ‘First Man’ in the very near future, it’s now commonplace for major studios to release a couple songs early. In doing so, it surely gets fans excited. But it also provides a glimpse into the heartbeat of a movie. Since Jimmy’s Daily Planet is a spoiler-free blog, I’ve purposely chosen a non-essential song from the soundtrack. But it’s a fascinating sneak peek sneak listen nonetheless. Ladies and gentlemen, I give you “Contingency Statement” by Justin Hurwitz from the ‘First Man’ soundtrack. Eerie and unfamiliar yet hypnotizing. And yet there has been controversy recently surrounding the forthcoming film ‘First Man’ because there isn’t a scene that depicts the American flag literally being planted on the moon. While I will withhold final judgment until after seeing this movie, it seems like a bad call by a director–Damien Chazelle–who has made so many right calls in his young, burgeoning filmmaking career. Without getting into the weeds here, the moon landing was an American achievement that inspired this country and the world. Another reality is that the third trailer for ‘First Man’ is the best one yet. Neil Armstrong was the first man to walk on the moon, but he did so with the help and support of an entire nation back on earth. That fact can’t be omitted from history.